The astaxanthin in Sunumbra sunscreens comes from a microalgae called Haematoccous pluvialis, which is considered to be the most powerful natural antioxidants yet discovered. Many people aren't aware that baby flamingos are born white. 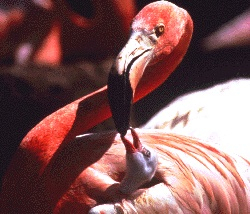 They only obtain their pink color once they eat food that is loaded with astaxanthin. It belongs to a class of naturally occurring pigments called carotenoids. Even though there are more than 700 naturally occurring carotenoids, most people are familiar with just a few and the most common one is beta-carotene. These are of course, crucial to your health. As a free radical scavenger, astaxanthin is 65 times more powerful than vitamin C, 54 times stronger than beta-carotene, and 14 times more potent than vitamin E.
Ability to cross the blood-brain barrier plus the blood-retinal barrier, where beta-carotene does not. The anti-inflammatory properties are being seen to provide athletes with increased muscle performance and faster recovery. With its powerful antioxidant qualities, it scavenges free radicals created in muscle tissue after strenuous exercise, thus also protecting the mitochondria - the powerhouses of the cell. Mitochondria being the parts of the cell that convert food to energy using ATP, or adenosine triphosphate, they are vital for the maintenance of energy and stamina levels. In addition to trapping free radicals, astaxanthin also de-charges singlet and triplet oxygen, thus providing its anti-inflammatory properties. It's superior antioxidant capacity over other carotenoids is due to it being oxygenated. The actual molecule has the longest double-bonded, conjugated polyene chain of any of the related xanthophylls, with both hydroxyl and carbonyl groups at each end. It is this configuration that provides the excellent antioxidant capacity, and the incorporation of free radicals into its polyene chain to trap them. Other carotenoids and antioxidants may perform one or two of these functions, but astaxanthin does them all, and in most cases, does them better.